The Angriest: Star Trek: The Next Generation: "Thine Own Self"
It is 14 February 1994, and time for another episode of Star Trek: The Next Generation. Commander Data (Brent Spiner) wanders into a medieval village on the planet Barkon IV with no memory of who he is and what he is doing there. While he is adopted into a local family, the radioactive fragments he has carried with him go unnoticed as they begin to make the villagers sick. Back on the Enterprise, Counselor Troi (Marina Sirtis) resolves to take the commander's exam to gain further command responsibility. On the whole "Thine Own Self" is a well-written and engaging riff on James Whale's Frankenstein adaptation, with Data inserted into a pseudo-period setting as the Monster. He does not fully understand the world around him, he tries to befriend a young girl, and ultimately he gets hounded to destruction by angry villagers with torches and pitchforks. Thankfully in between those touchstones it tells its own story; it's a nice blend of science fiction story and pastiche. Part of what makes the episode particularly enjoyable is how the audience is privileged with information that is not available to the characters. We know from very early on that the metal fragments the amnesiac Data carried into town are highly radioactive, but of course the only person on the planet with a knowledge of such things has lost his memory. The tension rises further the longer it takes for Data to independently discover the existence of radioactivity and form a hypothesis as to why everyone in town is getting sick and losing their hair before they all die. It is a great episode for Brent Spiner, who gets to be Data without actually having any knowledge of who he is. With the memory gone, he's basically all intellect and personality. We get to see him settle into town, face mistrust and prejudice, find a problem, solve it and get violently murdered in response all in the space of 40 minutes. 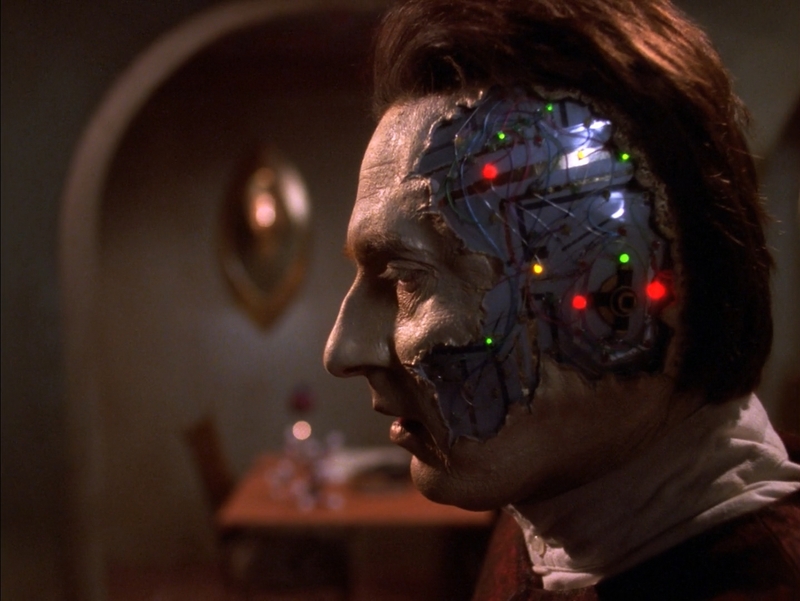 Of course being Data he is simply rebuilt and restored at the episode's end, but it is still a pretty unsettling thing to watch. Back on the Enterprise, Troi decides to seek advancement via a commander's test that will increase her Starfleet rank and authorise her to officially command the Enterprise bridge. It feels weirdly shoe-horned in, and does not in any way match with or complement Data's A-story, but within its own context it is a short but effective bit of character development. Marina Sirtis works well with the material, and shows a determination and resolve that's been building over a couple of episode in recent years - notably "Disaster" and "Face of the Enemy". Jonathan Frakes is also good this week: Riker is in a bind, caught between affection for his friend and former lover and a responsibility to assess Troi fairly but comprehensively. While unlikely to ever make a 'best-ever' list of Star Trek episodes, "Thine Own Self" is well-developed and nicely presented. In a deeply uneven season, its presence is most welcome. It is the ninth good episode out of 16, bringing the Season 7 quality ratio up to 56 per cent.